Christmas (and winter) is here. Christmas has finally hit the Olson house. With the impending blizzard on its way I spent the morning running our errands for the weekend and In-Law’s visit. Most important errand was of course the purchase of our first family Christmas tree. Its a nice one. We didn’t really get a chance to celebrate the holiday last year because we spent it in the hospital so we have been hoping to make up for that this year. I bought the tree down the road and started getting the lights put on as soon as I got home. Karin’s parents came up from New Jersey to spend the weekend. Undeterred by the forecast of a foot of snow they are safely staying in a hotel tonight after spending a wonderful day with us. My Mother-In-Law cooked an absolutely delicious dinner while Karin and I decorated the tree. After both, we had our own private Christmas as they will be at home in New Jersey for the 25th. 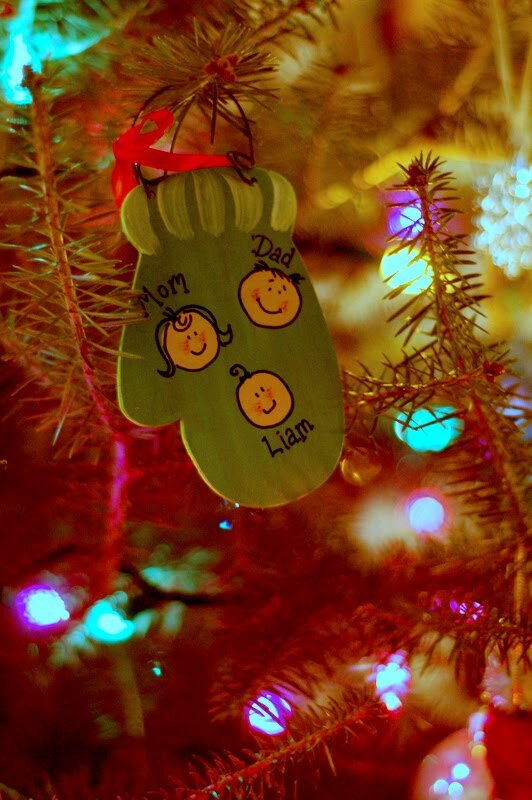 The ornament pictured is one of our gifts from them and is prominently displayed front and center on the tree. We had a great day getting ready for the holiday and for tonight’s storm. Weather Channel on TV all day as we waited patiently for the flakes. With the amount of snow outside now, I can’t tell you how happy I am that our new home has a garage. After the In-Laws left, Karin and I tidied up the house, got Liam ready for bed and watched a movie as the first inches started to fall outside. I forgot how good a movie Ratatouille is. The scene at the end when the critic tastes the dish blows me away every time. Nothing can bring the mind back to childhood like a familiar taste. Sometimes, food is magic. On the topic of underestimating things, Karin has been watching King of the Hill on Cartoon Network at night and again, I forgot how funny, smart, and well written that show is. Flying under the radar for all those years. Although I really like the new Christmas tree ornament pictured above, this one is my new favorite. This is a Bivona 3.5 neonatal trach. Its a custom fitted Flex-tend model. The balloon, or cuff, on the end pointing up towards the tree is compromised and unable to hold its place in Liam’s airway anymore. 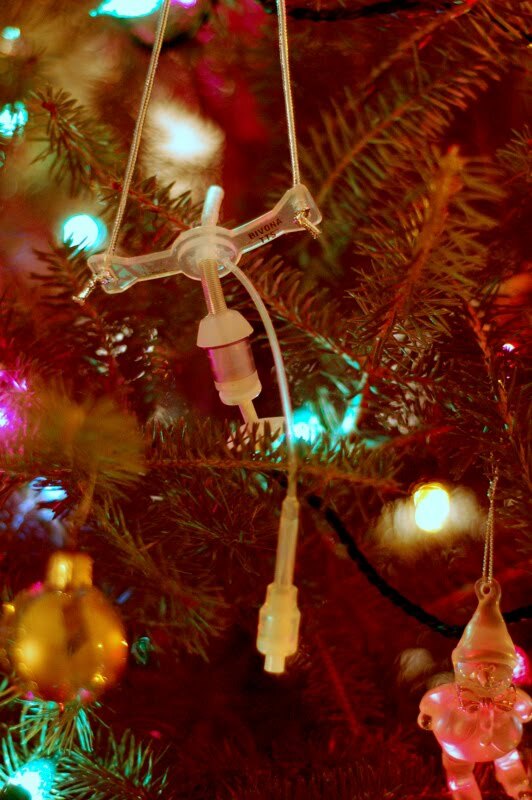 It was Karin’s idea after sanitizing it to string it up with some silver holiday string and display it on the Christmas tree. I love it. I suppose it could be seen as gross but the gallows humor that has developed between Karin and I in the last year makes this both funny and touching. I really miss my photoshop. Gotta get the upstairs desk and computer situation worked out pronto. Outside there is probably 4 or 5 inches on the ground and the storm has just gotten started. First storm in the new house and we have battened down the proverbial hatches. Batteries are charged up for the vent and pumps, refrigerator is full and we have nowhere to go until Monday afternoon. I have been looking forward to being snowed in with the family for months and it has happened with the first storm of the season. Yay me! Books will be read. Pictures will be taken. Football will most definitely be watched and hopefully, naps will be taken. Well, Liam is asleep in the crib next to me and I am fading fast. Another Law & Order rerun just started on cable and my pillows are calling my name. My house and heart are decorated in holiday cheer and I am feeling upbeat and positive about the coming season and new year. Can't wait until you become that famous author. You write beautifully and are an inspiration in person and in word. Love you lots…thanks for all you do for my daughter and grandson. You are the best. PS aren't you supposed to clean up before the in-laws come not after they leave. Eric I thank God daily for you!marion(mom) not yours, but if I could pick a son you'd by my pick!